So, two 1-0 results tonight. Wales on the wrong end of one in Ukraine, Northern Ireland on the positive side against Slovenia in Belfast. But both sides look in decent nick less than three months before Euro 2016. Thanks for joining us. Good night. Northern Ireland boss Michael O'Neill on Conor Washington: "He's a raw striker. He's come on the international stage and showed what he can do. He made a goal out of nothing and it’s a great night for him. "He's strong enough to fight against centre-backs and is particularly good in those inside channels. "It would be unfair to say if he's on the flight to France. He's done himself no harm at all, not only in the performance, but how he's fitted in with the group. It looks like he's going to be an asset to us. On the record of going 10 games unbeaten: "It's lovely to achieve something like that. It's for the squad – to go unbeaten for 10 games is a great achievement. I’ve emphasised that to the players." 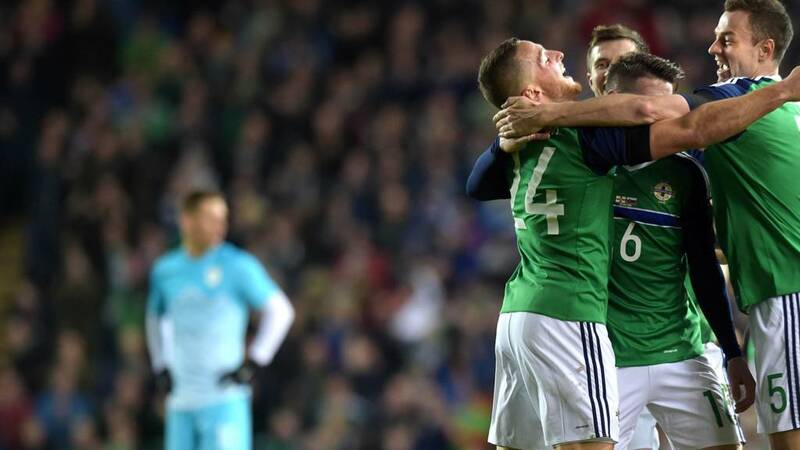 Northern Ireland goal scorer Conor Washington on BBC two Northern Ireland: "It's crazy. "For my goal the ball's come over the top and I moved two defenders of the out the way. The keeper was going one way so I stuck it in the far corner. "We've got the 10-game unbeaten record and that's brilliant. "For me it's unbelievable. It's been a bit of a fairytale four years but particularly the last four months." Ryan Kerr: Ten, yes ten games undefeated now for Northern Ireland. What a stat that is. Andrew Priestley: Great win for Northern Ireland. Solid at the back and nick a goal at the other end. That is the recipe for success in France. Keeper Roy Carroll on BBC two Northern Ireland: "I've been watching their penalties the last two days. I guessed the right way. He went that way in the videos. "I enjoy playing for Northern Ireland. It's great to play. It's nice to keep a clean sheet as well. I want to be pushing for that number one shirt - nobody wants to be sat on the bench in France. "I've had some bad nights out there at Windsor Park but tonight was fantastic." I mentioned earlier how good Joe Allen looked tonight - a metronome in the Welsh midfield. Boss Chris Coleman agrees, telling the press: "He's a great player. I don't use that term loosely. He's irreplaceable." "Michael O'Neill will be very happy, especially with a clean sheet. I'm delighted for Roy Carroll, it has been a tough season for him but he proved his worth tonight. It was a great penalty save, but I think the one after was even better." Former Northern Ireland winger Keith Gillespie: "Roy Carroll never lets you down. It's given Michael O'Neill a nudge about who will start in goal in France. "Conor Washington was a deserved man of the match and was a constant menace for the Slovenian defence." Controlled, patient and as good as they needed to be. Northern Ireland are 10 games unbeaten, which is a national record. Valter Birsa tries to poke a ball through that goes straight into the arms of Roy Carroll. And, as the PA announcer proclaims Conor Washington as man of the match, the referee brings the game to an end. Stuffed animals, hand puppets, actual animals and even the odd human. Our list of things named after footballers is growing... (Squirrel Regis is beyond brilliant). Elaine Cunningham: I have a number of stuffed animals named after footballers... Squirrel Regis, Steven Bearrard, Raheem Starling, Rafa Bearnitez! Which means Northern Ireland are three minutes away from a record 10th consecutive game unbeaten. A few late chances for Slovenia. Decent interplay sees Valter Birsa stride on to the ball on the edge of the area but Roy Carroll gets down low to his left to turn it around the post. Rene Krhin thinks he has a moment's space to have a go from the edge of the area, but Oliver Norwood stands up to deflect it wide. Elton Loggings: Had a hamster who was black and white and was doing flips in his cage on the first day so we named him LuaLua! Trevor Brennan: Had a cat named 'Shevas' (after Andrei Schevchenko), but my girlfriend stole her when we split up...still miss her (the cat). Danny Burke: As an Evertonian, as a child I had a goldfish called Andrei Kanchelsfish. Marcel: Got a Dutch mum & English dad.. Mum called me Marcel, dad called my twin brother Emlyn.. As a scouser that needs no explaining. Five minutes for Slovenia to find a leveller. There's little urgency though as they stroke it around at the back and Petar Stojanovic ends up putting it out for a throw-in. Kyle Lafferty's a nice bloke, isn't he? He shares his bottle of water with a Slovenian defender while they wait for a corner to come in. The corner, incidentally is cleared, and Slovenia almost muster a chance at the other end but lose out through miscommunication. So Josh, just to clarify, you named your rabbit after a player who had nothing to do with your club?